This little figure is immediately recognisable by her pose and highly characteristic headdress as the same depicted on many moulded terracotta plaques [EAX.201]. The “bi-cornate” headdress is the same, even including the pins stuck into it (on both sides here). Even the large cylindrical ear-rings, one shown head on, the other in three-quarter view are the same; so are the large tubular wristlets and the sensuous modelling of the plump arms. Certain details of costume differ significantly, however. There is no sign of the elaborate metal or jewelled girdle: the light belt, the tassels and the long sash suspended from it on the right side are quite different, as are the necklaces. From the rear it is clear that the woman held drapery in her left-hand. All the features suggest an origin in the north-west of the sub-continent, as does the sensuous modelling of the hips seen from the rear, and indeed there is an almost identical figure from Bannu, southwest of Peshawar, in the Peshawar Museum. 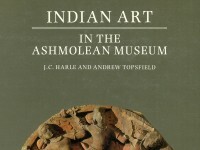 The Peshawar Museum and Ashmolean figures both share a striking feature, a large hole in the top of the head. In the former, a spike still remains stuck in the hole. The same hole occurs in the famous little Indian ivory woman found in Pompeii, which was formerly though to have been the holder or handle for some sacred symbol, or even mirror. However, a recent study of this and another ivory figure of roughly the same date has shown convincingly that the figures were probably one of the legs of a low small table or stool, and this would also seem to have been the purpose of their metal counterparts. The fact that this free-standing figure incorporates a little plate below the feet supports the theory. The Ashmolean bronze was hollow cast by the cireperdue process. Badly rubbed as it now is, the detail must have been very fine. Although part of the clay core remains, the limits inherent in thermoluminescent dating are too wide for it to be much use in dating fired clay of the historical period. What appears to be a tendency for the drapery of the skirt to flare outwards, noticeable in some sculptures in the north-west in the fourth and fifth centuries of our era. There is a feeling of robust sensuality about this figure which is nearer to the sculpture of the late Sātāvāhanas and the early Kusānas than to that of the last two centuries B.C. 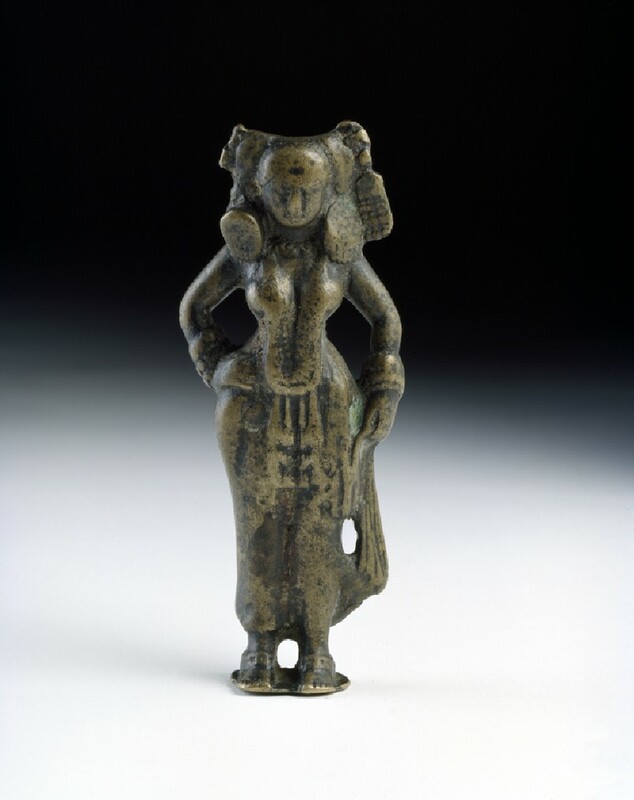 Closely related to contemporary yakshi figures in terracotta, this bronze figure may have formed a leg for a low stool or table.